Carl and Richard are coming to Ireland and Northern Ireland! That amazing podcast done by those technical and comic geniuses will be recorded in front of a live audience in three great cities on Oct 7, 8 and 9. Galway is our kickoff. We haven’t picked the evening guest yet but we’ll announce them soon. In Dublin, we’ll be joined by the astounding Mark Miller himself. He’s going to be recorded live in from of the audience. In Belfast, we’ll be joined by marvelous Martin Woodward who undoubtedly improve your software development process. We’ll start the day at 1:00 with a half day HTML5 conference and end the day with a .NET Rocks recording. Whether you are doing web development or app development with HTML5 technologies, this conference is for you. We’ve got 3 sessions that start off with how to handle touch in my HTML5 app and then diving off into ninja level talks with 3D and how you do performance analysis to make sure that your users are blown away. 1:10 – 2:00 – Touch Me, I dare you! 2:00 – 2:50 – You can do that in a browser? Touch Me, I dare you! Designing for a touch first web is becoming more important every day with the proliferation of touch devices ranging from phones to tablets to convertible laptops to touch monitors. The issue is that most folks think this just means having bigger buttons but they are wrong. Yes, understanding touch target sizes is important but that’s the absolute bare minimum. A great touch experience starts with understanding your user’s context and includes understanding the difference between touch and a mouse with issues ranging from how to handle gestures to thinking about things like your usage of hover state to scoping input correctly and more. In this brief session, we will dive into these issues and show you how to build a great web experience that will help you on all platforms and devices with touch interface. You can do that in a browser? Speaker: Michael Barr – CTO of Scaboodle and an outstanding speaker. He’ll wow you with his demos and his knowledge of creating an amazing experience for your customers. The web platform is amazing. With the onslaught of new capabilities in modern browsers such as WebGL, Pointer Events, Video, WebSockets, Web Workers, FileStorage, Geolocation and so much more, web development is more fun, and more challenging, than ever before. 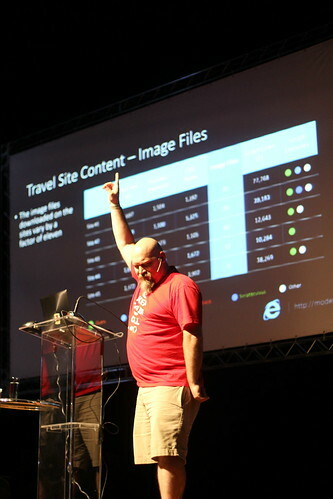 In this session, we’ll dive into some amazing demos and show you what’s possible in the modern day browsers and show you how you can do this yourself. Speaker: Josh Holmes – Senior Program Manager on the IE Developer Relations team. Building a high performance front end is a balancing act. You need to understand all the different moving parts and subsystems in the browser and how they interact with each other. Small changes can significantly impact page and app load time, memory consumption, and processor use which has a huge impact on your user’s experience! In this session, we will dive into the subsystems of the browser and learn to optimize performance on sites and in web apps. We will also deep dive into the new performance analyzing tools available expose good and bad run-time patterns for your sites and web apps, and provide users with a fast and fluid experience. Recorded live in front of you will be that amazingly popular podcast that’s reaching (literally as in actually as in for real) millions of developers each and every month. The guests and topics for the recording will be announced closer to the time but there are rumors that Mark Miller (if you haven’t heard of him, go listen to http://dotnetrocks.com/default.aspx?showNum=338 – brilliant and funny) is going to crash the party and join us in Ireland. We’ll also be highlighting some of the amazing folks from Ireland who are forging the way in technology. While onstage at BrazilJS, there was guy filming the talks and cutting together a video of the highlights of the conference. On the spot I decided that if he came back on stage I was going to strike a pose. So I did. And it was cut into the video with a Freddy Mercury image as well which was awesome and the audience loved it. But about a year ago, I hit upon an idea that has seemed to work for us. It’s a simple idea but works really well. I got two routers. One is for the parents and the other is for the kids. The one for the parents is what I connect to, the Xbox connects to, the Chromecast and the like. The kids don’t get this password and for further security, it’s in my bedroom. The other router is called HolmesKids and that one is the one that the kids connect to. It has parental controls on it and among other things, the parental controls shut it off as of 9:00 every night and then turn it back on about 8:00 the next day. No fuss, no battle, nothing for me to forget, works while I’m out of town and so on. It’s just simple and clean. This is something that even non-technical parents can set up. There are a lot of routers out there that come with parental controls and instructions on how to set it up. And once you have it set up, it manages itself (and your kids) with no further maintenance. One word of warning, make sure that you read what the parental controls will and won’t allow you to do. For example, some of the Cisco ones only allow you to manage up to 5 devices. My kids will do 3 phones, 2, laptops and 3 Gameboys so oops – we’re over that limit quickly.